One of the most common causes of a motorcycle accident is actual defects in the motorcycle. If you or a family member were hurt in a motorcycle collision through no fault of your own, you may be able to get compensation from the manufacturer responsible for the defect that lead to the accident. Here’s what you need to know. Many motorcycle accidents are caused by skidding, a driver who loses control of the bike, hydroplaning, skidding, swerving, spinning, or tire blowouts. In many cases, these issues can be attributed to defects in the actual tire of the vehicle, such as tread separation or moisture contamination. Sometimes, a defect in the engine or additional accessories can cause a fuse to blow, making the engine stall. A stalled engine can potentially cause a crash, especially in heavy traffic. Any defect in the way that the handlebars are made can cause serious problems later on. For example, clamps that crack or defects that cause a handlebar to move out of its designated position can easily cause a motorcycle rider to lose control of the bike and collide with a stationary object or another driver. When the materials used to manufacture a fuel tank are defective, a fuel tank can leak or explode in an accident, causing critical injuries to the motorcycle rider. Brake defects are one of the most common causes of motorcycle accidents, and accidents that are related to brake defects can be devastating. When brake pads or other brake components malfunction, it can lead to the inability to brake effectively or slow down the vehicle and avoid an accident. In some cases, multiple motorcycle defects have been narrowed down as either causing or contributing to a motorcycle accident. 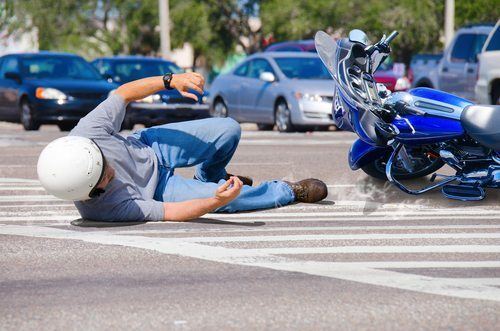 It’s critical to consult with an experienced Florida motorcycle accident lawyer regarding the collision to find out if any material defects were responsible for the accident and if any manufacturers should be held accountable for your injuries. The seasoned accident lawyers at the Slonaker Law firm have worked with many motorcycle accident victims and their families. We can help you pursue the full and fair compensation you deserve for your injuries, lost wages, and emotional trauma. Contact us today to schedule an appointment to discuss the details of your case and to learn more about your legal rights after a motorcycle crash. Call now at 352-629-6656 or 352-777-8176.